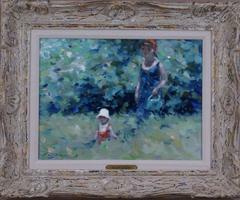 Impressionistic landscape painting by Andre Gisson (1921-2003) featuring a mother and child strolling through a colorful field by by a lake. 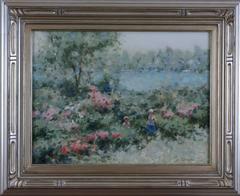 Oil on canvas measures 12 x 16; framed measurement is 16 3/4 x 20 3/4 x 2. Weight is 4 1/4 lbs. Gallery tag Frost & Reed on verso. André Gisson was born 'Anders Gittelson' in 1921 in Brooklyn, New York. A widely-collected American Impressionist painter, he is known for landscape, still life, portrait and figure paintings. André Gisson was born 'Anders Gittelson' in 1921 in Brooklyn, New York. 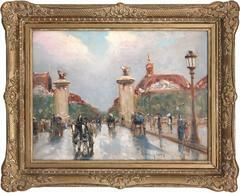 A widely-collected American Impressionist painter, he is known for landscape, still life, portrait and figure paintings. In order to be seen as belonging to the French Impressionist movement, he claimed to be a Frenchman born in 1910, and adopted the artist name 'André Gisson'. He lived in New York, Westport, Connecticut and france for much of his life, and travelled widely. He studied at the prestigious Pratt Institute in New York. After graduation, he joined the United States AArmy and become a captain during World War II. 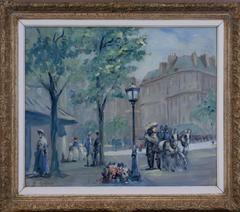 Gisson continued his studies in Europe, where he came under the influence of the great French impressionists. 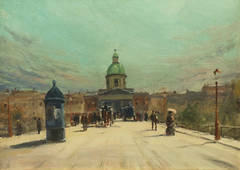 Upon his return to New York he ada[ted the style and technique of impressionism, and used small, broken brushwork and soft and vibrant colors. Gisson's landscapes and beach scenes depict the French countryside, where he painted every summer, and the region around Lake Mahopac in upstate New York, where he lived for many years. Gisson's still life compositions show a Japanese influence in his work; whereas the French influence is more pronounced in his landscapes and figures. Several of Gisson’s paintings have been published and distributed internationally. His works have been exhibited in leading art galleries throughout the country for over four decades, as a solo show extended from New York, Washington, Philadelphia, Texas and California, also overseas locations in London, Paris and Tokyo. His work are part of the collections of the Smithsonian Institution and the Triton Museum of Art, in North Carolina. Among his private collectors were President Lyndon B. Johnson and W. Somerset Maugham. Gisson died in 2003 in Atlanta, Georgia. He was listed in The Artist's Yearbook (p. 332, 2000), Artists in the Southwest Art (p. 64, 1993) and Who Was Who in American Art (p. 1296, 1999). The painting was taken to a professional art restoration expert for cleaning and to inpaint small scratch. Presents beautifully. A Summer Stroll, c. 1973.